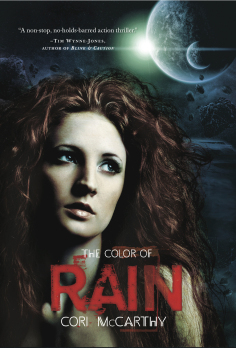 The Compulsive Reader: The Color of Rain is Out Today! The Color of Rain is Out Today! Cori McCarthy's debut novel The Color of Rain is finally out! It's been popping up in stores a little early, and shipping from online vendors, but now you can get it everywhere and as an e-book. I highly recommend this novel--it's wonderfully written and suspenseful, and it totally made me cry (which is a good thing when it comes to books)! You can click here to read my review, and here to read an interview with Cori! To celebrate the release, I am giving away a signed copy here on the blog! Just fill out the form below! Want a signed copy for yourself? Click here to get one (and support local indies while you're at it!). Also, if you are going to be at BEA later this month, Cori will be signing copies of her book there as well! Already have my copy!!! It's soooo good! Criminal by Terra Elan McVoy + Giveaway!